The long dry spell didn’t last long enough for Saratoga Speedway after the rain began falling Saturday just in time to cancel the scheduled the nights cars racing program involving the IMCA Modifiedes, Bomber and Mad Max cars. The rainout was the 2nd of the season for the Modifiedes and the Bombers with the first coming May 13th where all that was complete was the qualifying before the rain fell. The Modifiedes return August 26th along with the Dwarf cars and the seasons last visit from the Wilroc Sprint cars while the Bomber cars don’t return until September 9th. This coming Saturday night weather won’t get the victory either way as it will be a rain or shine racing program with the Black Creek oval hosting a action packed evening featuring two special attractions. 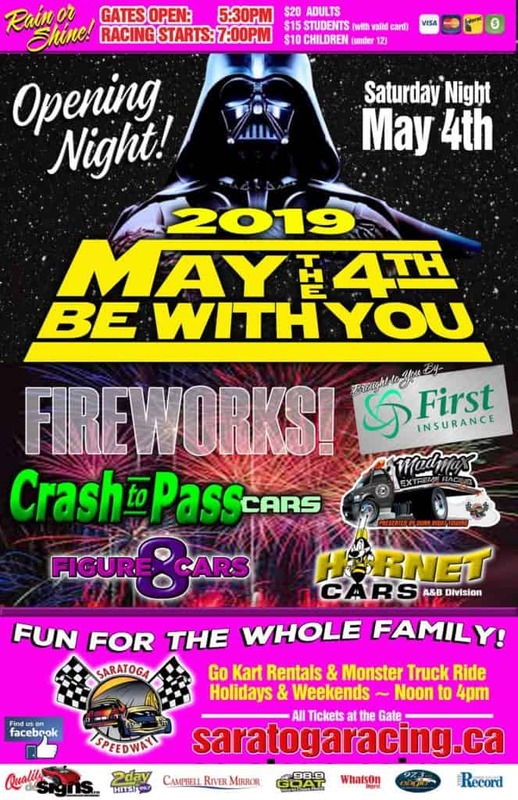 The speedways most popular event the Crash to Pass Boat race will be one of the highlights with the seasons last boat race along with the first ever speedway Limo jump as performed by the Crusher stunt of team and driver Josh Beckett from Washington State. Beckett who flew thru the air into a stack of cars on July 15th will take a full size Limo and power his way up a ramp and fly nose first into a stack of cars in what should be a must see event. With only 6 races left in their 2017 season the point battles in the Crash to Pass, Mad Max, Hornet cars and Road Runners will take the remaining part of the schedule to determine their respect point champion beginning this Saturday night. In the Crash to Pass points race Mike Jenkins sits in first only 26 points ahead of Scott McLellan while only 156 points separate the top 6 drivers and in the Road Runner class defending point champion Ryan Guest sits in first by only 13 points ahead of Austen Hack. The Mad Max class like the Road Runners is a 2 car battle with Danielle Antonik leading Damon Dunn by 57 points while the Hornet A class also a 2 car battle has Carter Hintz with a 158 point advantage over Luke Dixon. The most competitive class as far as the points battle goes is the Hornet B class with 14 year old Randi Joyce the current point leader 102 points ahead of Jimmy Antonik with only 170 points separating the top 7 cars of Taylor Pheaton; James Laidlaw; Kiana Westra; Evin McLuckie and Stephaine Addison. Point battles in the speedways other 2 classes has Boston Larson ahead of Chad Taks by 48 points with Charlie Akerman only 110 back in 3rd and in the Modifiedes Chris Beaulieu and Travis Stevenson have made it a 2 car battle with Beaulieu holding a 152 point advantage for the overall lead.